We may take our studies seriously, but we also know how to have fun and celebrate special occasions. Over the years, Truman has accumulated many traditions and here are a few stories surrounding some of our most interesting ones. In 1915, the student body was discouraged after the football team experienced a losing streak that lasted several seasons. To revive school spirit, a committee suggested adopting the bulldog as a team mascot because of its tenacity and ability to hold on and fight until the end. The baseball team played under the Bulldog name for the first time in the 1915 season, and the football team began using it a year later. This fun week-long celebration, which occurs annually in October, has taken place on campus since 1939. Homecoming still features a pep rally, parade, and team competitions to encourage school pride and spirit. More recently, activities such as the lip sync competition, tailgate, and a 5K run/walk have become part of the festivities. Many alumni return to campus to help celebrate Homecoming, one of the University’s most cherished traditions. Students, alumni, families, and friends can connect with part of Truman’s history by stopping to take a photo by the original cupola that sat on top of Kirk Memorial for many decades. When Kirk Memorial underwent improvements in the summer of 2013, the old cupola could not be made watertight and some of the wood had rotted. It was replaced by a new cupola created to look like the original and constructed primarily of aluminum along with insulation and roofing material to protect the dome structure. After the original cupola removed from Kirk Memorial, it was placed in the area outside the east entrance to the Ruth W. Towne Museum and Visitors Center. With its easy-to-access location, it provides the perfect backdrop for photos. It’s no accident or malfunction that the weathervane atop Kirk Memorial at the south end of the Quad hasn’t changed directions since July 1, 1996. 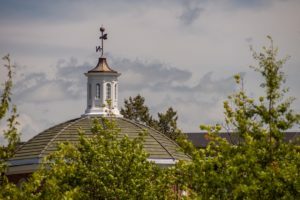 When the University’s name was changed from Northeast Missouri State University to Truman State University, the weathervane was welded into place to permanently point northeast in honor of the school’s history. When a new cupola was installed in 2013, its weathervane was also welded in place to continue the tradition. Every spring since 2001, Truman students have devoted a day of service to the Kirksville community to thank local residents for their support of the University and its students. For the Big Event, students and other members of the Truman community scatter throughout town to help residents with raking, window washing, painting, and more. 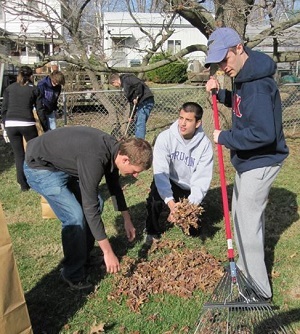 TruCare is an international service event where the Truman community volunteers for service projects during the month of March to make a difference globally. 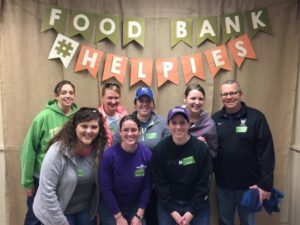 While Truman students serve Northeast Missouri through the Big Event, Truman alumni and friends around the world join a service project or volunteer individually in their communities. TruCare is open to all alumni, family, and friends of Truman. In the 1920s, it was against the rules to chew gum in class. According to campus lore, students used to stick their chewing gum inside an old suit of armor named Oscar that was inside the library. 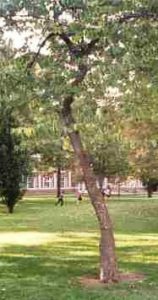 That hiding spot was later replaced by a tree on the east side of the Quad because it was closer to classrooms. Some said adding your gum to the tree would bring good luck. Others said contributing to it on your way to an exam would ensure a passing grade. The original gum tree was knocked down by vandals in 1999, and the tree made its farewell appearance as a float in the Homecoming parade that same year. Within days of the first gum tree being knocked down, a new one was appointed (see photo). The replacement tree survived for many years until it was lost due to a drought in the summer of 2012 and had to be cut down a year later. 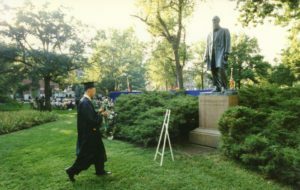 During Commencement in 1928, the graduating class and faculty started a new tradition when they paused in front of the newly dedicated statue of University Founder Joseph Baldwin, located on the south end of the Quad in front of Kirk Memorial. The class president placed a wreath at the base of the statue, a symbolic gesture in recognition of Baldwin’s educational ideals and standards. Now, during each spring Commencement, those students attaining a perfect 4.0 participate in the Laying of the Wreath Ceremony. One of Truman’s newer traditions, National Spirit Day started in 2011 as a way to unite University supporters around the world. On the first Friday in October, students, faculty and staff, alumni and friends of the University show their Truman pride by wearing Bulldog purple or Truman apparel and by decorating their homes, offices, and vehicles with Truman gear. The Alumni Association sponsors a photo contest, and some of the best photos show babies or the family pet sporting the school colors. The tradition of Purple Friday was established in 2009 to encourage students, faculty, and staff to demonstrate their Bulldog spirit by wearing purple on campus each Friday. Purple Friday activities include student gatherings in the Student Union Building and music on the Mall. 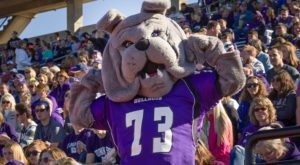 And if you wear purple on campus on Friday, you may be selected for prizes awarded to some lucky Bulldogs who proudly show their Truman spirit. 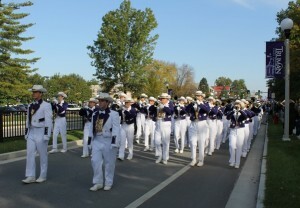 Purple and white—the school colors that unite Truman students, alumni and fans—date back to 1902 when Basil Brewer wrote the University’s first school song which he named “The Purple and the White.” The colors were adopted as the school colors and have become a firmly established tradition. 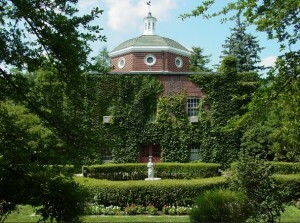 The Sunken Garden—an area that marks the former location of the very first Baldwin Hall which was destroyed by a fire in 1924—is the site of many weddings. Perhaps this is because a campus myth says that if a couple first kisses at midnight on one of the benches in the garden, they will eventually marry.